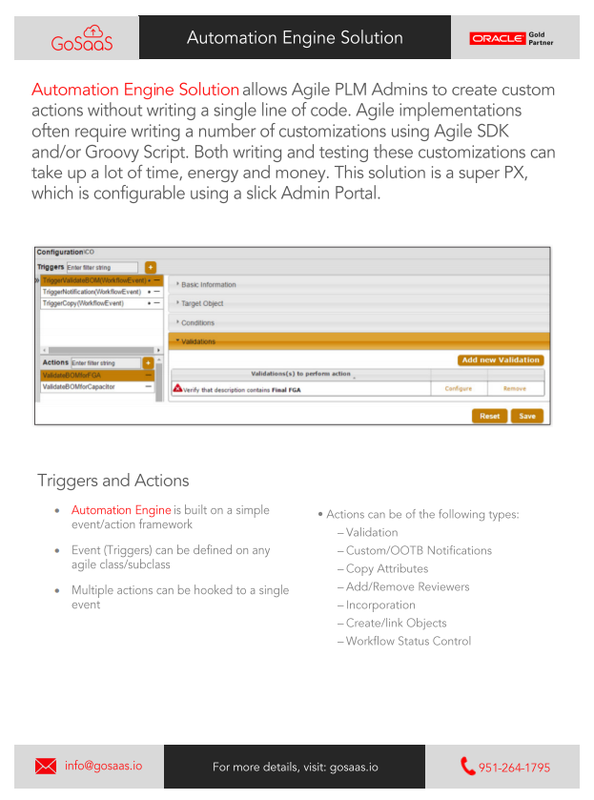 Allows Agile PLM Admins to create custom actions without writing a single line of code. Agile implementations often require writing a number of customizations using Agile SDK and/or Groovy Script. Both writing and testing these customizations can take up a lot of time, energy and money. This solution is a super PX, which is configurable using a slick Admin Portal. The action will only get executed if certain pre-conditions are met. The Automation Engine Solution can perform a series of lookups (as in a chain) to go to the desired level. For example, it can get an item from affected-items, go to its BOM Table, look for a certain part type within the BOM and find a certain value for it. The solution supports all attributes and some Special Keywords such as $autonumber, $date, $count, $empty, etc. The Automation Engine Solution can have its own email templates.